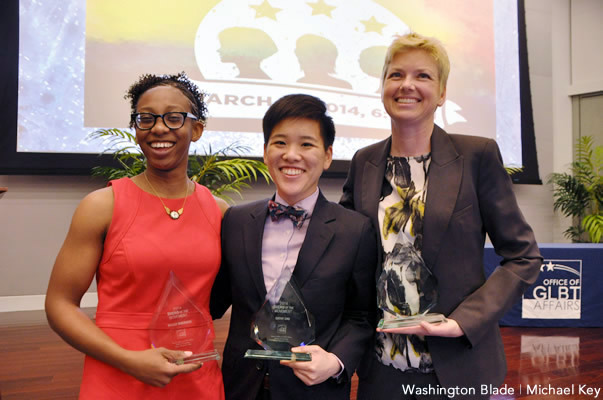 On behalf of his Office of GLBT Affairs, D.C. Mayor Vincent Gray on March 21 presented the city’s 2014 Sheroes of the Movement Award to three women chosen for outstanding contributions to the “LGBT movement and community” of the District of Columbia. In a ceremony at the federal Fannie Mae Conference Center on Wisconsin Avenue, N.W., Gray handed the awards to Cathy Chu, Youth Leadership Manager for the local LGBT youth advocacy and services group SMYAL; Amy Nelson, Supervising Attorney at Whitman-Walker Health’s Legal Services Program; and Kelley Robinson, Assistant Director for Youth Engagement at Planned Parenthood. Nelson, an attorney, among other things, oversees Whitman-Walker Health’s client intake, supervises staff attorneys and represents clients — about half of whom are LGBT — in the areas of health care access, public benefits, consumer rights and workplace rights cases. She is credited with playing the lead role in launching the city’s first Name and Gender Change Clinic to assist transgender people in updating their legal identity documents and personal records. In partnership with the local group TransLAW, the Name and Gender Change Clinic has served more than 270 clients and has trained more than 150 volunteers to carry out its services. Among other things, Nelson has served on the board of Miriam’s House, a residence for HIV-positive, homeless women. "The clinic, first of its kind in the Washington area, is a partnership between TransLAW (Trans Legal Advocates of Washington) and Whitman-Walker, which specializes in serving HIV/AIDS and LGBT (lesbian, gay, bisexual, transgender) clients."